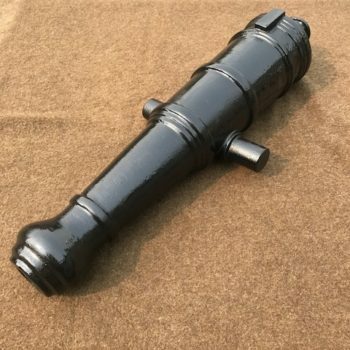 CAN05 – Carronade, 1/2 scale, 1-1/2″ bore, 72#, 25″ long. A beautiful ship gun, with below center trunions. The full scale & 1/2 scale gun have the distinctive ring cast above the cascabel. Hern scale guns are accurate Historical Reproductions, patterns made from war department ordinance drawings. 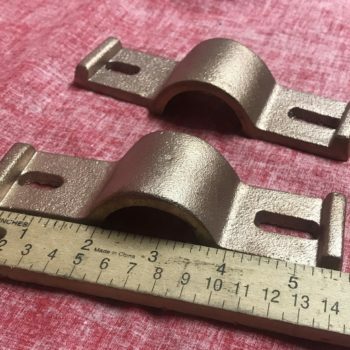 Some liberty has been taken as to the bore diameter to match the commonly available DOM product for a quality cast in place steel liner. 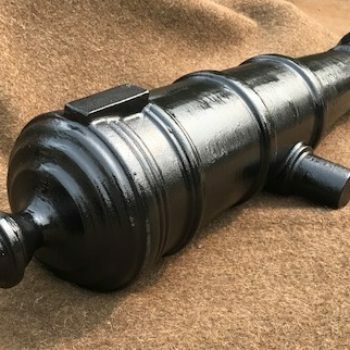 On this gun, the narrow neck behind the muzzle limits the bore diameter to 1-1/2″. This is smaller than a golf ball. This little beauty comes pre-packaged in a wooden crate and price includes UPS freight to your door! 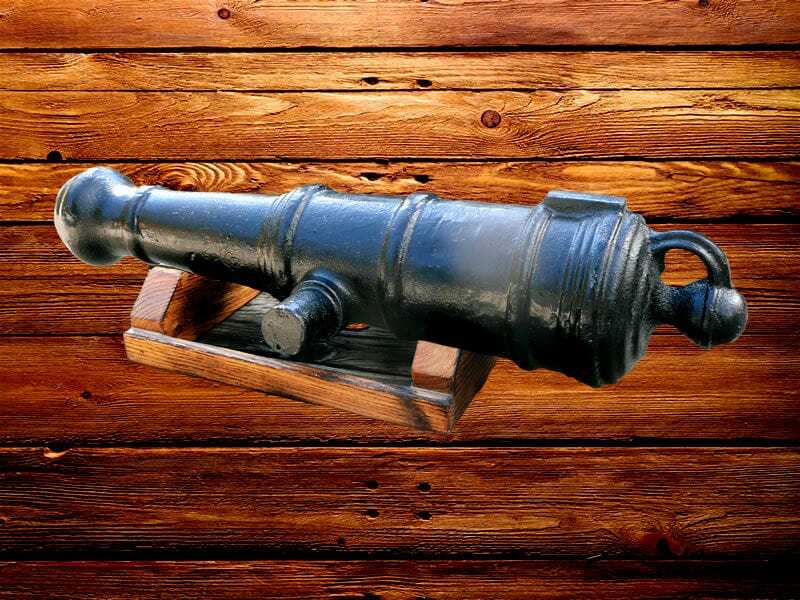 With its distinctive eye at the cascable, the U.S. Carronade was considered the logical sea cannon. It was easily secured for controlled recoil. The loop also made rapid dock-to-ship transfer of the weapon safer and quicker. 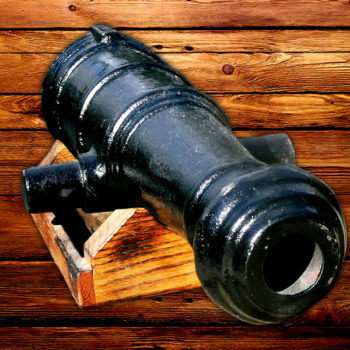 The stout U.S. Carronade is physically shorter than many of the cannons of its time. The design reflects tight shipboard quarters and allowed fast reloading in the space provided. Trunnions are below center. 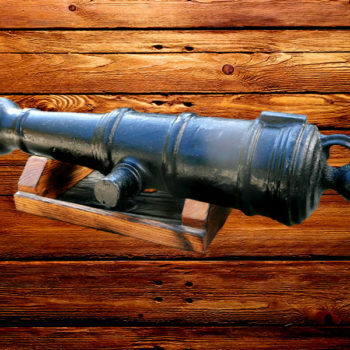 The U.S. Carronade was not only a weapon of war but found use as an “Insurance Gun” to lower the insurance rates of the merchant ships in parts of the world where risk was high. Written history is rich with the descriptions of “Hell at sea” that was the space around shipboard cannon during the full pitched battle. Hern Cannon and mortar barrels are made with Steel Liner Tubes with minimum 1/4″ wall thickness. 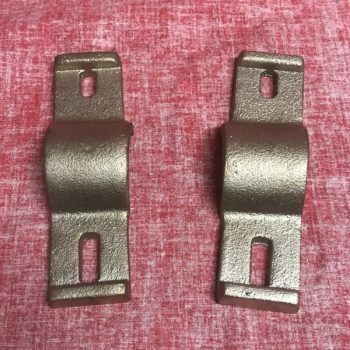 and with welded breech plugs. For bores larger than 2 1/4″, we use 1/2″ Wall Drawn-over-Mandrel (DOM) tubing. Breech: 7”, CHEECKS: 7 1/8", OAL: 25", OAL: 32 1/2", Trun D: 2”, TRUN L: 2", TRUN OAL: 11 1/4", TRUN-CASC: 16 1/4"